Successfully Added Vanadium V - 1080P HD Watch and DVR with Night Vision (8GB) to your Shopping Cart. Join the secretive and elusive ranks of the top professionals with this silver metal Vanadium V HD Night vision watch. It’s dangerous to go alone, so take this ultimate Vanadium V Watch and you will be able to infiltrate Dr Badvibes secret lab and record all his crazy experiments, doomsday devices and mutated monster Wibblesnap. You can secretly record videos, take photos and record sound, even in complete darkness! Think about it, nothing can stop you from secretly recording video up close anymore, and you can also have an amazing looking professional watch which is both stylish and weatherproof. Do you find yourself having to hold heavy and difficult-to-carry equipment when you want to record night-time video, this awesome gadget slips right on your wrist and with a push of a button you are recording HD 1920*1080 Video, in day or night! Picture this, you are walking home from a night at a jazz bar no one has heard about, filled with hipsters, and you got some great footage of your friends and some beautiful girls dancing, which would have been annoying, embarrassing and difficult to record with a conventional DVR. Instead you had the Vanadium Watch; there was nothing extra to carry since it is part of your outfit, you were able to conveniently record everything that night, even with the dim lighting in the club. As you walk home, you notice strange goings on and chanting in the bushes. You quickly start to record with your amazing new watch and post the wonders you recorded on the 8GB HD of the Vanadium onto YouTube, you then become an internet celebrity, your life is bro. Hold the Start button for 3 seconds to start recording, hold it again for 3 seconds to stop, it couldn’t be simpler. Look cool, stylish and have the convenience of secretly recording videos and images at any time of the day. Have you ever started to record your videos secretly and load them up to find out the lighting was bad and you couldn’t see anything? No problem with the Vanadium Night Vision Watch! With its 4 Infra Red Cameras, you can covertly record close up videos or take snapshot images of whatever you set your sights on. 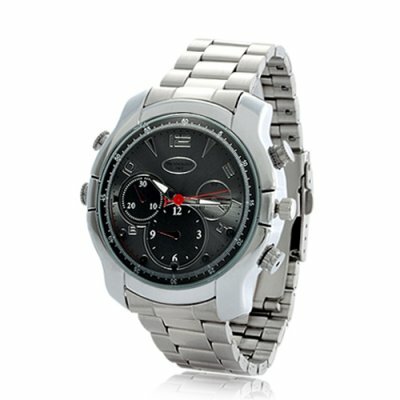 Even without all its advanced functions this watch is worth buying just on the merit of its superb design, when you then consider its features; image capture, HD video recording at night with IR, separate audio recording, weatherproof, 8gb hard drive and all this for an amazing price. The Vanadium HD Watch is a deal you don’t want to miss. This excellent robust watch is available for delivery now! Don’t delay, place your order and we’ll ship it out tomorrow, from your favorite source for high tech electronic goods, Chinavasion. How to turn IR Mode on; Start the video mode by holding the start button for 3 seconds, then wait a moment before holding the mode button until the status led flashes red three times, IR mode will now be on, to turn IR mode off, press the Mode button once more and the status led will flash blue to show IR mode is off. Hold the Start button again for 3 seconds to now stop recording video.